Applications: These brush wheels are for fixed machines with rotating shafts, such as bench grinders. They are ideal for applications where the work-piece can be presented by hand (always wear suitable protection) to the wheel. They are ideal for stripping, cleaning and brightening small fabrications, sub-assemblies, components and castings. Product Notes: These wheels are made with brass coated steel wire, which gives greater flexibility and durability than grey steel wire. They are supplied with either Multi-Centre fittings to enable you to choose from the bore sizes listed below, or there is the option of fixed 32mm centres. Bore Sizes: Multi-Centre:13, 16, 20, 22.2, 26, 30 and 50mm. Option: 32.0mm. Max Speeds: 150mm Dia: 6,500rpm. 200mm Dia: 4,500rpm. 250mm Dia: 3,600rpm. 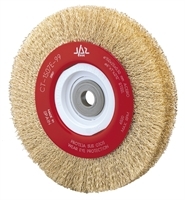 Also Available: We also offer similar brush wheels in stainless steel wire.